I read your post “Streets and Tracks” and I think you’re working on the assumption everyone cares to live when in fact many of us are indifferent. Who’s to say Randy Scott thought he had the skill to do what he did, could it not have been that he just didn’t care? 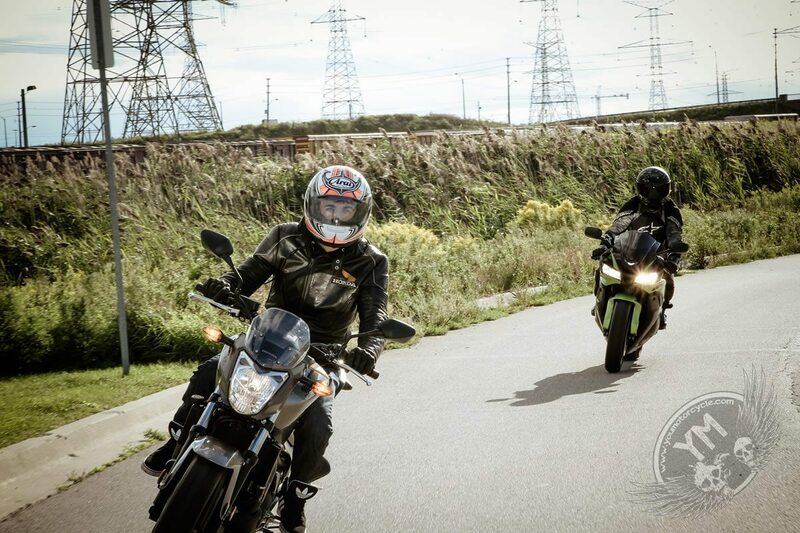 It doesn’t do much for the image of the rest of the law-abiding motorcyclists, and it is irresponsible, but we can’t work on the assumption that someone was being arrogant or having poor judgement, when in reality a lot of people just aren’t afraid. Your first paragraph described the feelings of motorcycling in much greater depth than just the proverbial wind in your hair description, and I loved it. You concluded that “the only place that you’ll be at one with all of those sensations is on a bike.” You’re absolutely right. It’s not that my father wasn’t a fighter. He sure was. Type 4 glioblastoma is terrible and the average lifespan after diagnosis is three to four months. He fought for four years. In that time I saw just one of countless worse ways to die than in a motorcycle accident. When I look at the state my father was in for the past few years the thought of dying doing something I love is actually very comforting. I can relate to Arlene Philips when she says “I’d rather die than suffer like dad” while describing her father’s dementia. A brain tumor is much the same, with much worse. When I hit a corner fast and hard, lanesplit in downtown Toronto, or ride to the extent of my skill limit with little margin for error left, it isn’t about “questionable judgement” or thinking I’m “good enough”. It isn’t that I’m ungrateful for everything I still have or that I think I’m a great rider either. 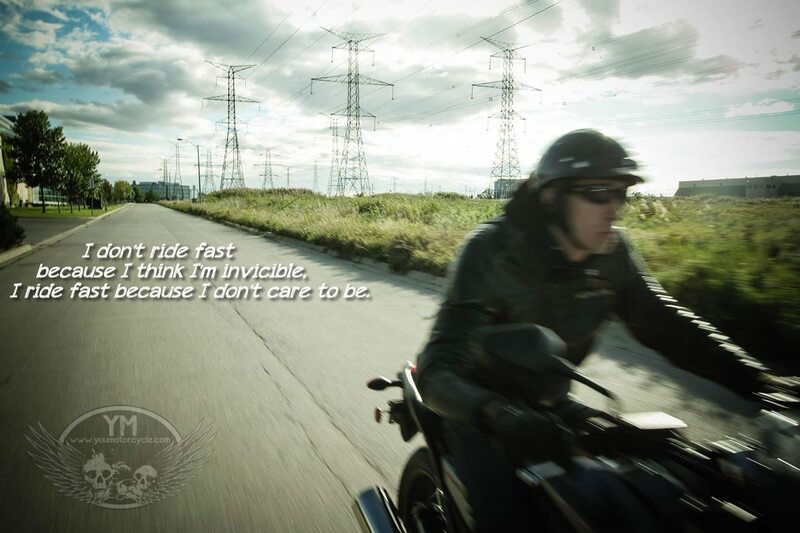 When I ride like that it just comes down to the fact that I really don’t care. Life is short, my father passed at 54, his father passed at 53, and call me crazy but I’ll continue doing what I can to get my kicks before I turn 55. Please don’t mistake me for lacking judgement, but I do hope you’ll understand that when my day comes I just hope it was a fun one, and somewhere far, far away from a hospital bed. I’ve seen my share of those already. Yes I’m aware that more motorcycle accidents in hospital beds than in coffins, that’s part of the risk I take knowingly. You might also be interested in reading my post titled “How to Stop a Motorcycle Show Off” and the “Death on two wheels: is there anyone else who just doesn’t care?” thread on BBO. 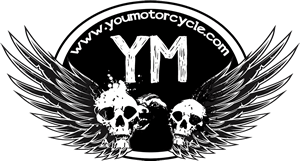 Motorcycle Mojo is a great Canadian motorcycle magazine. Unlike other magazines which feel like a collection of press releases and advertisements stapled together by a revolving door of writers and editorial staff, Motorcycle Mojo has a solid team with diverse motorcycling backgrounds. These people are smart, they love motorcycles, and it shows. True story: before I began working in an office full of complimentary motorcycle industry magazines, I ustacould pay to subscribe to various different mags for a year here and there. Mojo was the only magazine I ever renewed my subscription to, time and again. I believe the one year subscription is good for 10 issues. Each magazine is over 80 pages, and unlike other motorcycle magazines Motorcycle Mojo doesn’t have advertisements every other page. 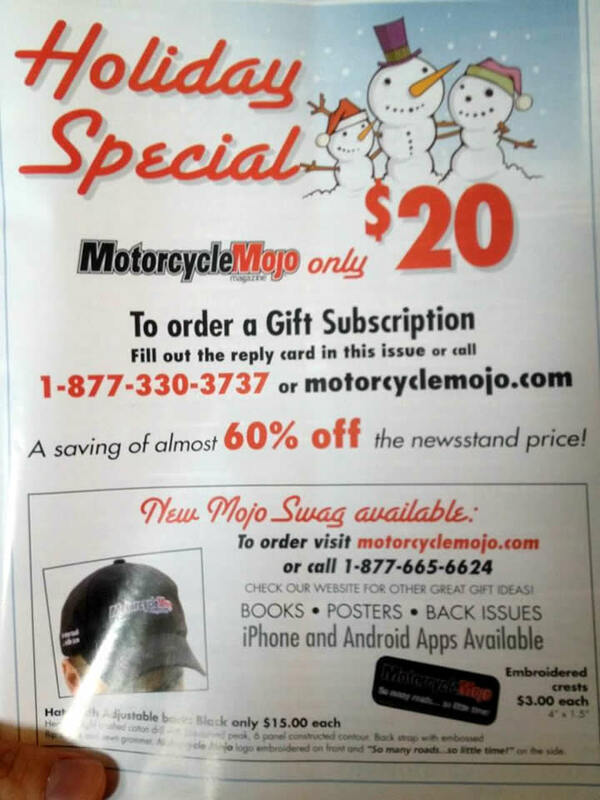 In fact, I counted 13 consecutive advertisement free pages in the first half of the mag, and another 23.5 consecutive pages without advertisements after that… For $20, it’s an awesome Christmas gift / holiday gift (whatever) for your favorite motorcyclist. Just remember that we’re all motorcyclists and by definition, we’re all awesome, regardless of if we ride the same line or not. Dear Stu my name is Stu also . I just want to say I agree with you on ebikes, I have seen many of them breaking all kinds of laws, even when the police watching. As a biker who’ s been riding since 1970. They should have d.o.t. helmets on and some kind of plating along with a safety course surtificate. Living in a small town in ont. There are too many near misses, also lights should be on ebikes and bicycles. Yours Stuart gray .